NW Running Boards carries Piaa, Vision, KC Lights and Hella in stock. Find the driving light that fits your needs and your budget. We have some very reasonable priced LED lightbars! Driving Lamps are absolutely sensational! Now you can replace your factory fog lamps with a driving lamp that clearly outshines them all. The new 410 Driving Lamp features PIAA’s new Intense White beam color and is specifically designed to fit in a square opening in your bumper or grill, such as the Ford Super Duty and a variety of other vehicles. Big, bold design in a small package. Ultra thin housing allows for easy installation. Designed specifically for small, mid-size trucks and SUVs. Unique black mesh style lens cover offers additional protection while enhancing your vehicle’s appearance. Whether you’re racing across Baja or simply traversing your favorite back road, the RS800 Halogen Shock Lamp offers unmatched durability. It’s indestructible, with its high impact resistant polyamide housing, unbreakable polycarbonate hardclear-coated lens, and stout mounting system. Even better, the Shock Lamp features computer-designed Multi-Surface Reflector with Twin Color Dual Beam H4 bulb. The result? 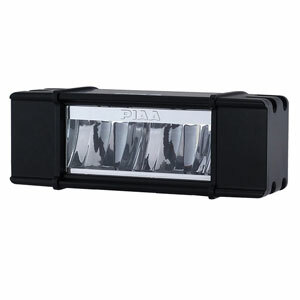 Legendary PIAA illumination in a package engineered to perform anywhere – in any conditions. Designed specifically for race applications, the PIAA Shock lamp is not sold as a complete kit. See details below. Not recommended for highway use.